This T-shirt is baby-blue with a teddy bear on it that says “I Wuv Hugz” across its belly. 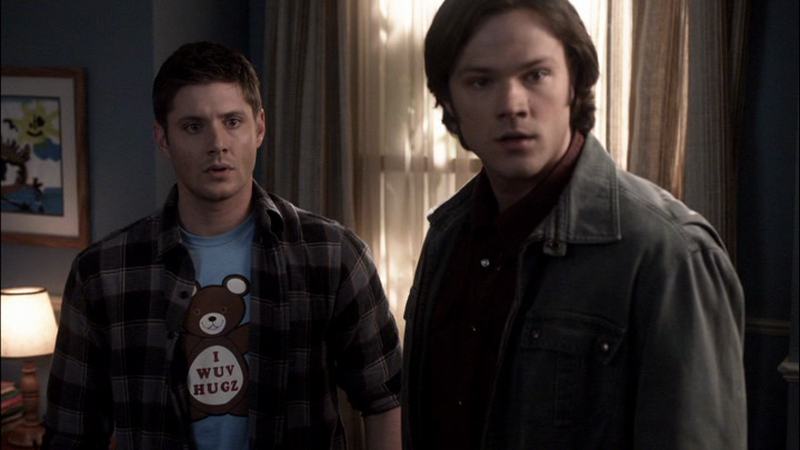 Presumably, Dean owned this t-shirt when he was 4 years old. In Dark Side of the Moon (5x16), Dean finds himself in this t-shirt when they visit a memory of his from when he was 4 years old. FATE: Sadly, the real version of this t-shirt was most likely much smaller and was possibly passed down to Sam (if it survived the fire) and then discarded like all childhood clothes.